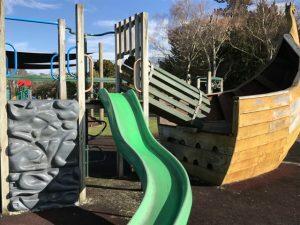 The theme for this playground is a Viking ship, the ends of which sit between a huge structure of playground equipment including tunnels, climbing walls, bridges, and a double metal flying fox. In other parts of the playground there are swings, including a bucket swing and preschooler swings. There’s preschool equipment under a shade sail including a seesaw, mini slides, steps, little fire truck and abacus, roundabout and wobbly bridge. At the back of the playground, there’s a rugby pitch/cricket ground which you could use for running around / ball games etc if there’s no match on. There are picnic tables dotted around and toilets right near the playground. In other parts of the domain there’s a Rose Garden with paths through it which kids could ride their scooters on (nearest the State Highway). If you go further into the domain, past the sports field, there are ducks, deer and birds in aviaries. Address: bordering the main SH2 but closest entrance for the playground and parking is on Christian Street.